His power: Beast has enlarged feet that he can use to latch on to surfaces, superstrength, and generally enhanced physical capabilities. 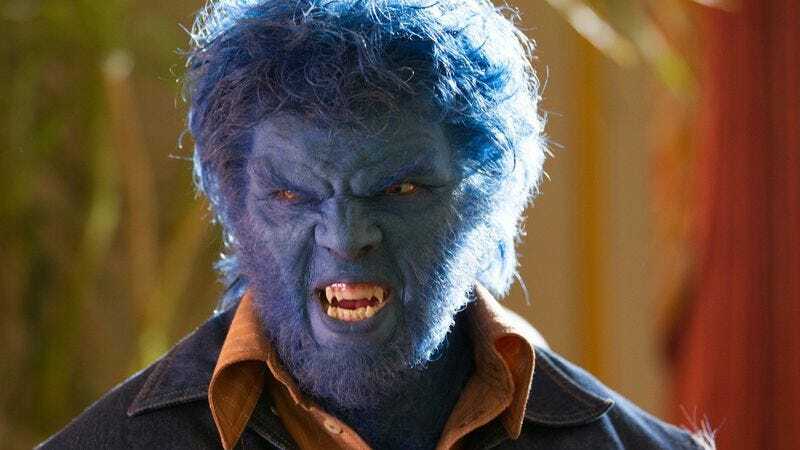 He also gains blue fur, claws, and fangs after taking a serum intended to heal his mutation. His story: After a brief cameo on a TV screen in X2, Beast is properly introduced in X-Men: The Last Stand as an old friend of the X-Men who now serves as the U.S. government’s secretary of mutant affairs. He rejoins the mutant team when Worthington Labs announces it has created a cure for genetic mutation, and helps fight Magneto’s Brotherhood during its assault on Alcatraz Island. X-Men: First Class explores the start of Hank McCoy’s friendship with Charles Xavier, and he works with Charles and the C.I.A. to fight Sebastian Shaw’s Hellfire Club. Hank falls for Charles’ friend, Raven, and tries to use her DNA to create a serum that could heal their mutations and make them look like normal people. The serum backfires and Hank becomes even more beastly when he sprouts claws, fangs, and blue fur, but Raven believes that this is who Hank was always meant to be. In X-Men: Days Of Future Past, Hank is the only confidant of a deeply depressed Charles, and Hank has developed a new serum that suppresses both of their mutations while also giving Charles the ability to walk. Wolverine gets the two of them back in action to free Magneto from jail, and Hank lets the Beast loose when Magneto tries to kill Mystique in Paris. The events of that movie change the XMU timeline, and Hank remains by Charles’ side in X-Men: Apocalypse, teaching at Xavier’s School For Gifted Youngsters when he’s not with the X-Men taking out ancient Egyptian villains. Played by: Steve Bacic in X2, Kelsey Grammer in X-Men: The Last Stand, Nicholas Hoult in X-Men: First Class, X-Men: Days Of Future Past, and X-Men: Apocalypse. Currently, Beast is: Teaching the new class of X-Men and probably thinking about rekindling his past romance with Mystique, who is back at Xavier’s School. Where will we see him next? There are no planned future appearances for Beast, but he’ll most likely show up in the next X-sequel.